We apologize that the website was down. We are happy to share a $5 off for returning customers [Promo Code WGT5). *For services that are not listed here, feel free to request as long as it's legal, ethical and well-intended. It's urgent, can you get it done for me pls? 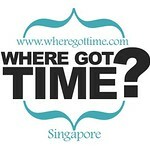 WGT - Where Got Time?